Remember my Skew socks? They’re done… but I have to re-do the cast-off. Both socks are too tight at the cuff. I… HATE… RE-DOING… CAST-OFFS. So friggin’ tedious. And what was I thinking when I cast-off not one, but BOTH socks too tightly? Extreme frustration. For the last year-and-a-half, I’ve been getting routine ultrasounds of my thyroid after a complaint to my doctor of mild throat irritation revealed a small-but-not-exactly-insignificant nodule on the right side of the gland. Nothing about this nodule changed for a good long while, until… my last ultrasound, taken a few weeks ago, showed that the nodule has gotten larger – I’m now 1mm away from a biopsy. And… a new nodule has formed on the left side as well. So… I’ll put on my “positive face” and say, “Hooray for Science, for catching stuff like this early! Yay!” But I’m silently feeling like my body is betraying me big-time. Read further for more evidence on this. The other is running. Years ago, before my daughter was born, I got back into running after a long absence and joined a relay team to race in The Jersey Shore Relay Marathon. I did this for a couple of years, then stopped working out in any regular way for a really long time. A few months ago, I started walking at lunchtime at work with a friend of mine from another department, which worked wonders for both of us. Then my husband and I started a “Couch-to-5K” running program with the intent of racing in The Chocolate Miracle 5K in Hershey, PA. It started off great… I felt energized and excited and happy to be moving again… and then I got carried away. Tried to do way too much too soon. And now I’m nursing what I believe are shin splints, although now it may be worse than shin splints because I didn’t stop running when the pain started. So while my husband is running 3 miles every other day easily, I’m back on the couch, with ice packs and ibuprofen, awaiting a doctor’s appointment tomorrow evening. Now, I’ve played a lot of sports in my day, but I have never, NEVER been sidelined by an injury before. So I’m afraid you’ll have to excuse me while I take this opportunity to feel sorry for my old, decrepit self for a few days… or until I get the all-clear to start running again. I haven’t been knitting at all. Don’t get me wrong – I want to, but I’m in a bind. I was going to finally start The Cider House Rules Vest for my husband, but since the beginning of the year, he’s become The Incredible Shrinking Man... literally. He’s watching what he eats, he’s exercising… and so far he’s shrunk at least 2 sizes since I bought the yarn for the vest. And he doesn’t want to slow down yet. I’m not about to start a vest for him, just to find that when it’s finished, it’s too big for him. No way, not going there. Well… since I may be spending an inordinate amount of time on the couch with my shin splints, guess I’d better find something else to knit… just don’t know what that’ll be yet. Let’s end this on a good note: I had a very nice Mothers Day weekend with my family. I hope you all did, too. Ohhhhhhhhh… I am SO not earning the “yarnyMarni” nickname these days. I’ve been doing a lot of things… I’ve definitely been busy… it’s just that everything I’m doing has nothing to do with knitting. I haven’t even had the time to help a friend of mine out with some pattern issues she was having… Bad knitter! Go straight to your room, young-ish lady, and you just think about what it means to be crafty! Honestly, I really do have to get back into the swing of things. Can you believe I’m still not done with Skew? I’m only a few rounds away from binding off the cuff and calling it a day, but nope… haven’t even picked it up. Less than a half inch to go... seriously, what's taking me so long??? I’m making a promise to myself right now – I’m finishing Skew today. Really, I’m gonna do it. Because I absolutely have to start knitting The Cider House Rules Vest for my husband, now that I have the yarn and needles. Yep, this is happening… today or tomorrow. Really. Vest, prepare to be cast-on! … reading Catching Fire now. The Next Knitting Challenge: Sparkle! I had such lofty goals of starting The Cider House Rules Vest last weekend, but it was not to be. You see, there was a yarn issue. The pattern calls for Classic Elite‘s Mistral (85% pima cotton, 15% superfine alpaca). Sounds nice, huh? Well, I’m sure it was… but it’s discontinued now. So I need to substitute, and this is always challenging for me, because choosing a suitable alternate that’ll have similar hand, drape, and gauge is kind of hard when you’re not familiar with every yarn on the market. So I called in Dori The Expert, who, after asking me about my preferences, recommended Tahki Yarns‘ Cotton Classic Lite (100% mercerized cotton). However, she didn’t have enough of the stuff on hand in any color to begin the project, and would order whatever color I wanted… after she returned from her vacation. In Hawaii. Sometime next week. 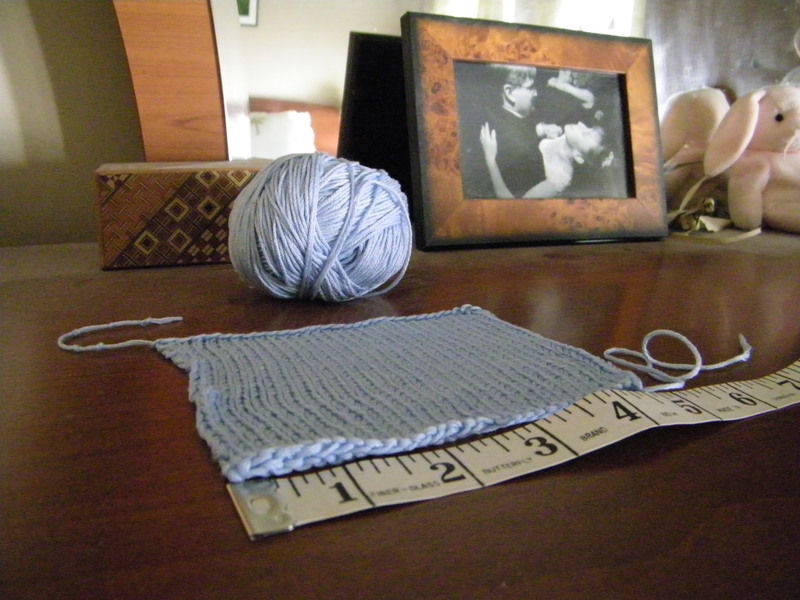 But I could, of course, get my gauge swatch going in any color she had that pleased me. I liked the blue… see above. I’m certain, though, that my husband will not choose blue for his vest. Stay tuned as we ponder over shades of gray and green. Anyone know where I can get 14 skeins of Karat super-fast? The Near Future Of Knitting. This is not a blog post… not a real one, at least. It’s mostly a simple request to stay tuned, because the knitting’s gonna get kicked up a few notches next weekend. Until then, I remain dedicated to Skew – the first sock’s done, the 2nd one’s about ½ done. I’m sort of taking my time with the 2nd sock – it’s so much fun to knit, I’m in no rush to see it end. If you ever considered this pattern and thought it would be too difficult… trust me, it’s not. Because if you’ve knit socks before, then you already have all the skills you need to Skew. For me, the toughest part was learning the Magic Loop method of circular knitting, and even that wasn’t too bad (I just had to practice it a bit before starting the project). No surprise here... 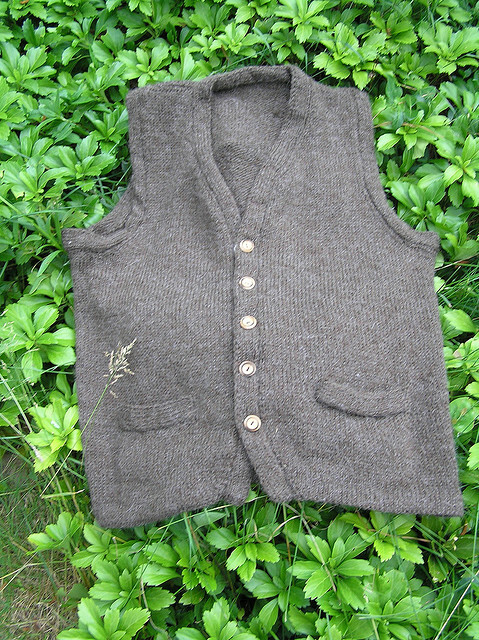 The Cider House Rules Vest will be cast-on next weekend, as soon as I get the yarn. The Primavera Cardigan, by Cecily Glowik MacDonald for Blue Sky Alpacas. I... LOVE... this. You should see the perfect box pleat in the back - it's to die for. Seriously. 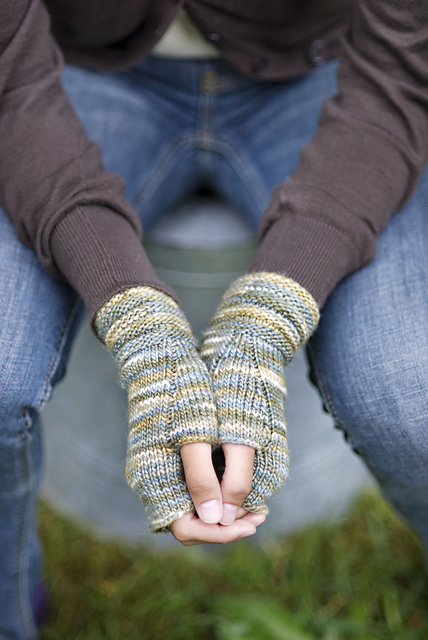 Welted Fingerless Gloves by Churchmouse Yarns & Teas. I knit 3 pairs of these last year. I'll knit at least 8 pairs this year... starting this weekend. Satin Ribbons tee, by Irina Poludnenko for Tahki Yarns. I can only hope I have enough time this Spring/Summer to knit this.